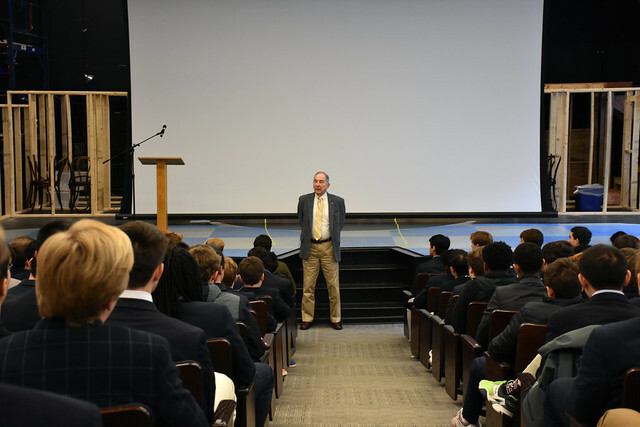 Holocaust survivor Emanuel “Manny” Mandel shared his childhood memories of World War II and his internment at Bergen-Belsen Concentration Camp at Upper School assembly this week. The Mandel family moved to Budapest, Hungary, soon after Manny’s birth in 1936. At age six, he entered first grade, attending a neighborhood school visible from the windows of his family’s apartment. He walked himself to school, a yellow star affixed to his jacket. As a young boy, he thought the star was “a mark of distinction.” Only later did he realize it made him a target—and that his parents had secretly followed him to school each day to make sure he arrived safely. When he later asked for a bicycle, he was told no. “I’m not going to let you out of my sight,” his father said.